Over the years, foundations do shift or stones get moved off their foundations. Please Notify the Office if we need to adjust a stone. Our grounds crew is continually repairing 100+ year old stones. Donations throughout the year allow us to do this task. Headstone vases are sold at the cemetery. 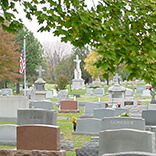 Vases purchased through the cemetery have no installation fee. Power washing of stones is available. Call the office for pricing.